The summer is already here and it is incredibly hot these days. But this is my favourite time of the year! I love it regardless of the insupportable heat and the mosquitoes. Summer time brings the feeling of holidays even in the working days. The sunny evenings make you want to go to the park, sit on the grass and drink beer from the bottle. And even if you don’t do it it’s great just to know that you have this option! There are so many more good things about the summer: long days, dinners outside, ice cream on every corner, sea side vacation, fresh vegetables, summer fruits… I really love the fruits. 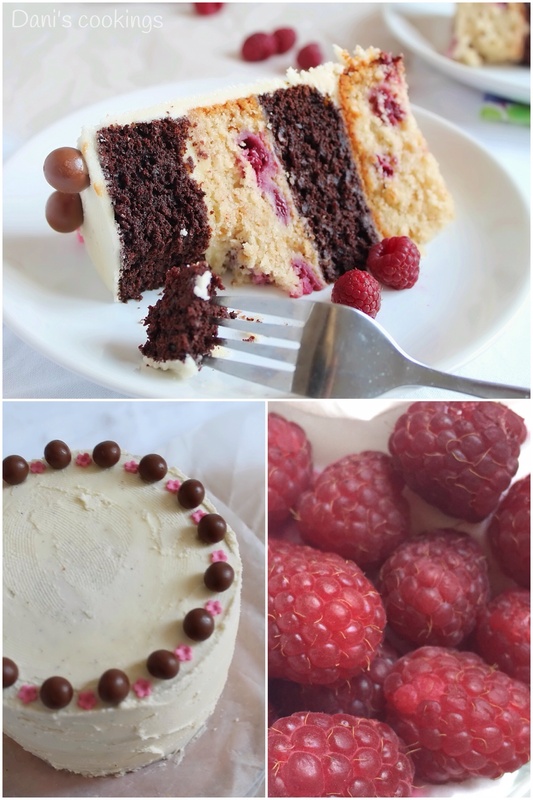 To celebrate this lovely season I made a raspberry cake. 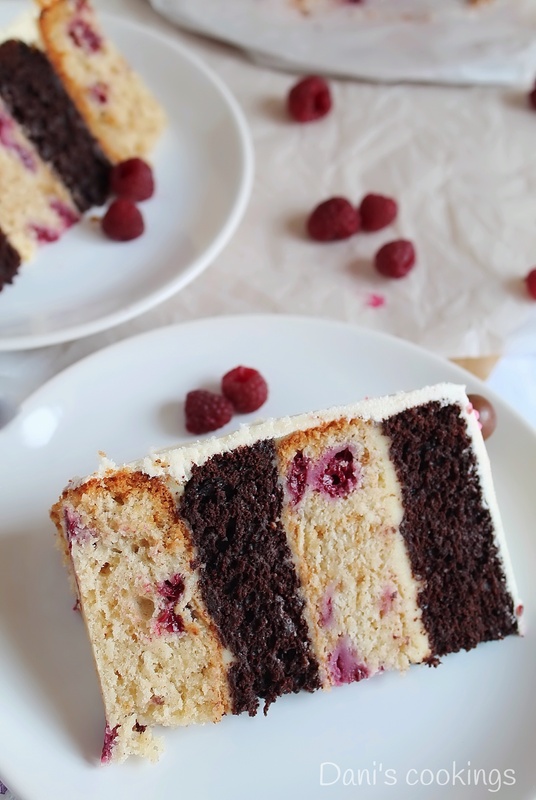 In fact it was raspberry chocolate cake with cinnamon and vanilla. I wanted to have a combination of tastes to nicely complement each other. Something like a baked summer cocktail. The cake became exactly as nice as planned and also very, very tall. 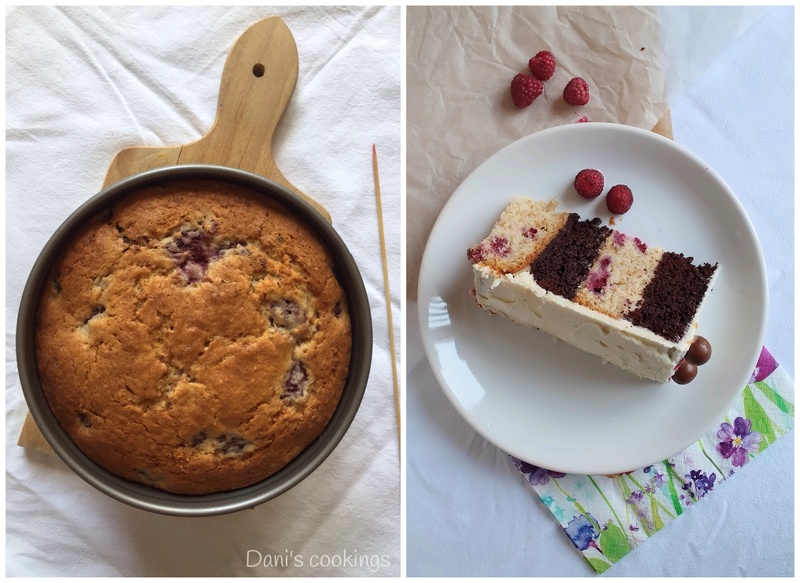 My idea was to make a “little cake” so I used my favourite 17 cm cake pan. 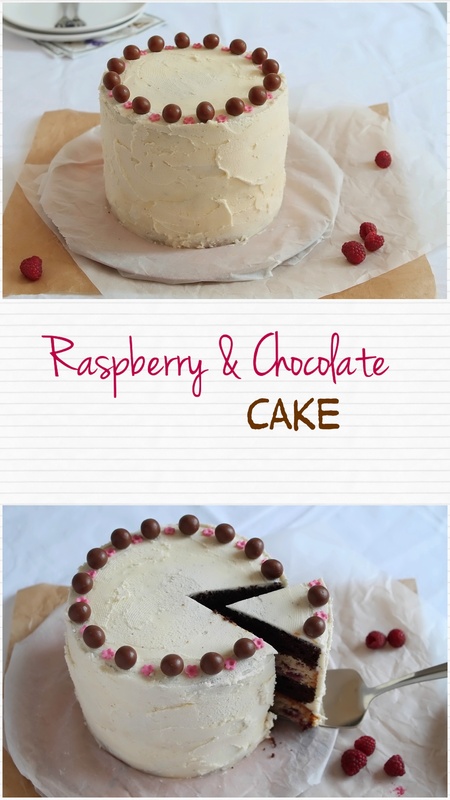 I baked two different small cakes which I cut in half horizontally and layered one over another. 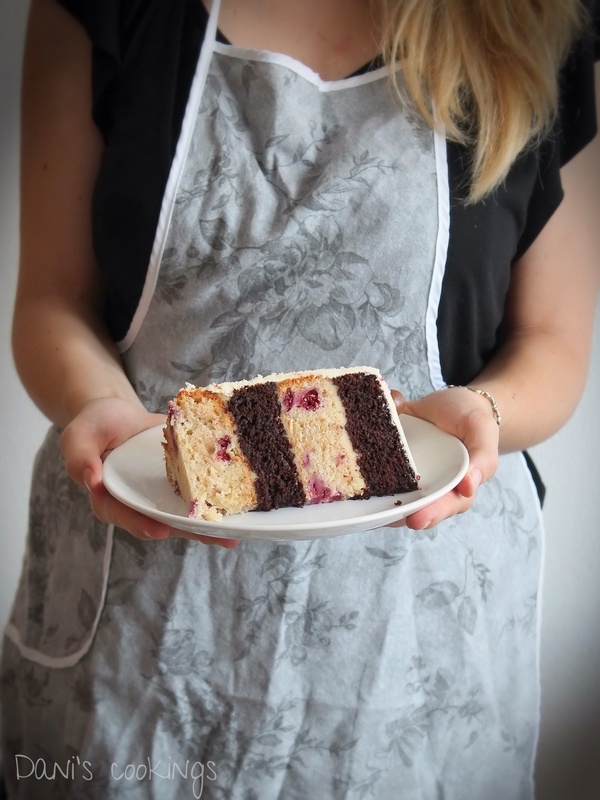 The final result was a rich and pretty four-layer cake. The only “inconvenience” was that the pieces became enormous because of the height (this can be easily avoided just by using a 20 cm pan instead). 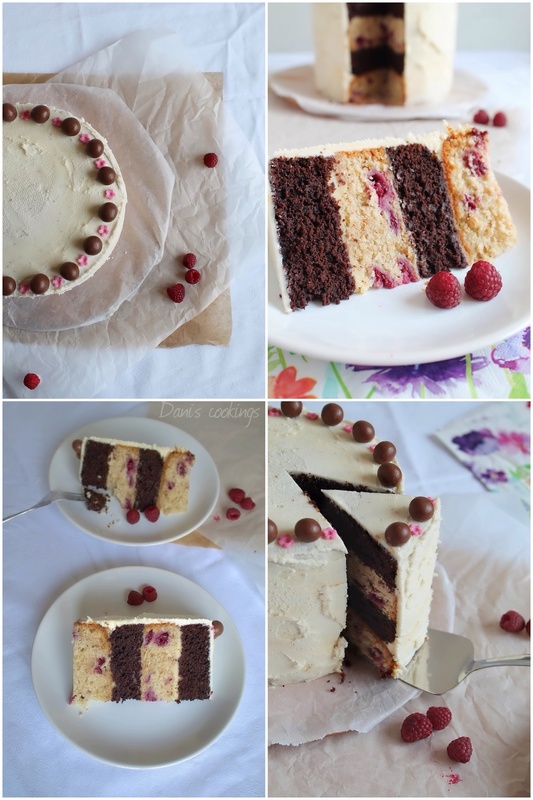 I really loved the way the dark chocolate layers were combined with the raspberry ones – both visually and taste wise. 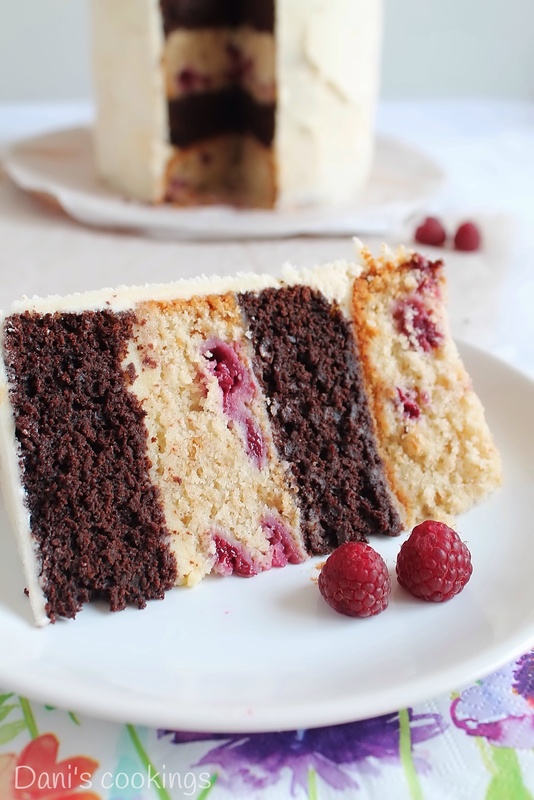 Both cake bases were very moist and the vanilla filling was adding a nice velvety touch. 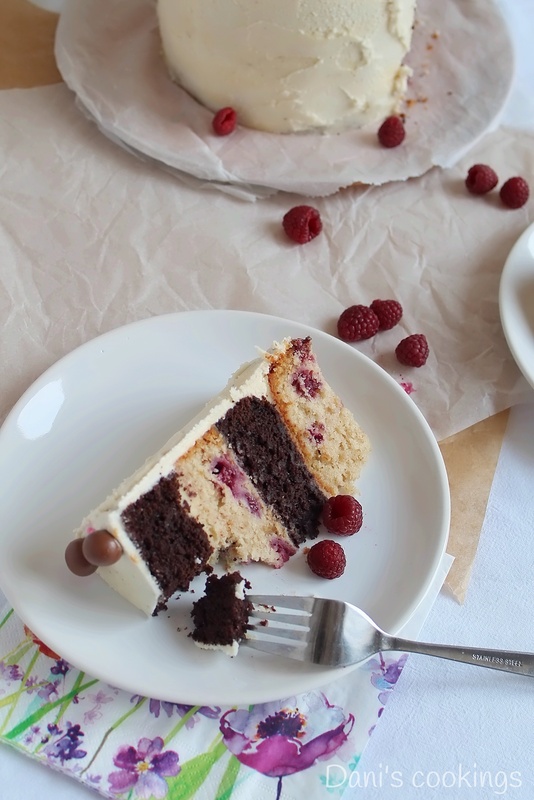 This raspberry chocolate cake is great for any kind of celebrations. 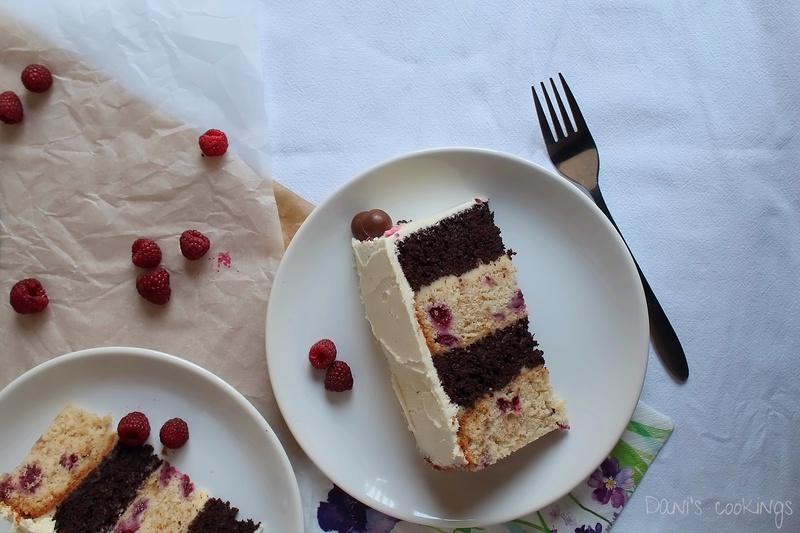 It can be prepared in all seasons and also with frozen raspberries instead of fresh. Grease a 17 to 20 cm cake pan (depending on how tall you want your cake) and line it with a circle of baking paper. Preheat oven to 180°C. Combine flour, baking soda, baking powder, cinnamon and salt and set aside. In a separate large bowl combine oil, butter and sugar and beat until smooth. Add vanilla extract, egg and yogurt and mix well. Add the flour mixture and whisk until homogeneous. Add raspberries and stir very carefully until just absorbed in the batter. Bake the cake for about 40 minutes or until a toothpick inserted in the center comes out clean and the top becomes golden brown. 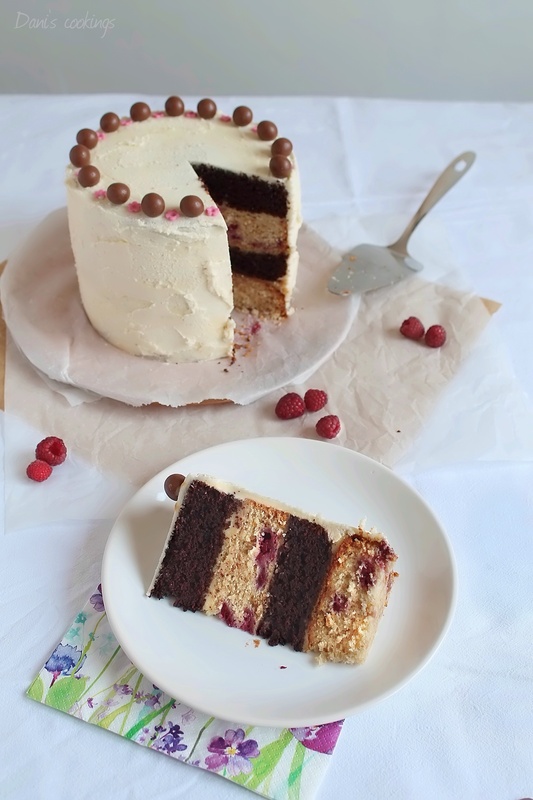 Allow the cake to cool for 10 minutes before carefully running a knife around the edge. Remove it from the pan and let cool completely on a rack. Grease a 17 to 20 cm cake pan and line it with a circle of baking paper. Preheat oven to 180°C. In a large bowl combine sugar, flour, cocoa, baking soda, baking powder and salt. Add eggs, yogurt, coffee, oil and vanilla. Beat until all the products are well combined and the batter becomes homogeneous. Pour the batter into prepared pan. Bake until a toothpick inserted in the center comes out clean (about 40 minutes). Let cool for 10 minutes before removing from the pan. Transfer the cake to a wire rack to cool completely. Combine the pudding powder with 1 tbs sugar and 100 ml milk. Bring the rest of the milk to boil together with 2 tbs sugar. When it starts simmering remove the pan from the stove and add the pudding mix. Stir well and return to the fire for few more minutes. Whisk continuously to avoid burning. When the pudding starts getting thicker, remove the pan from the stove and add the butter. Stir until the butter melts in the pudding. Cover the pan with a lid and let cool for about an hour before assembling the cake (don’t leave it too long because it will get very thick). In a large mixing bowl cream together butter and vanilla. Add in the sugar, 100 g at a time, beating well after each addition. Continue mixing until light and fluffy. 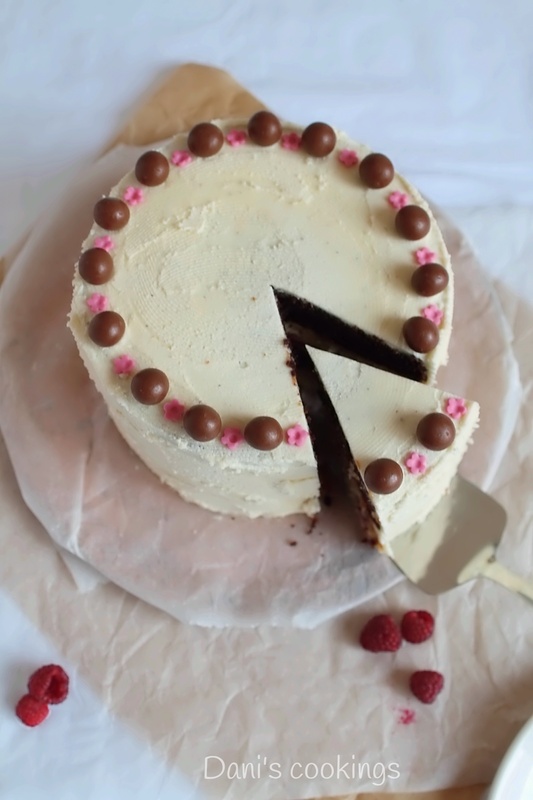 When the cake bases are completely cooled, use a serrated knife to cut each layer in half horizontally (it is easier if the cakes are refrigerated). 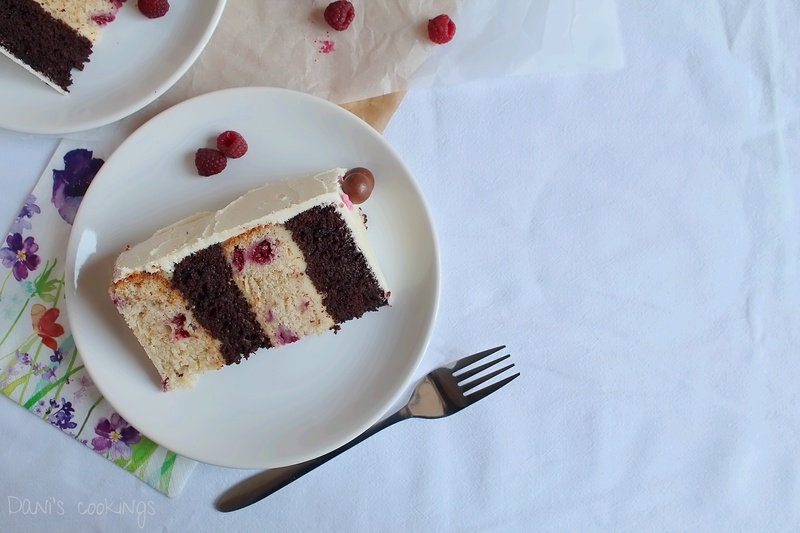 Place one half on a serving plate or on a cake stand. Spread on top 1/3 of the vanilla filling. Cover with another half layer, different than the first one. Continue the process until placing the forth half layer over the last 1/3 of the vanilla filling. 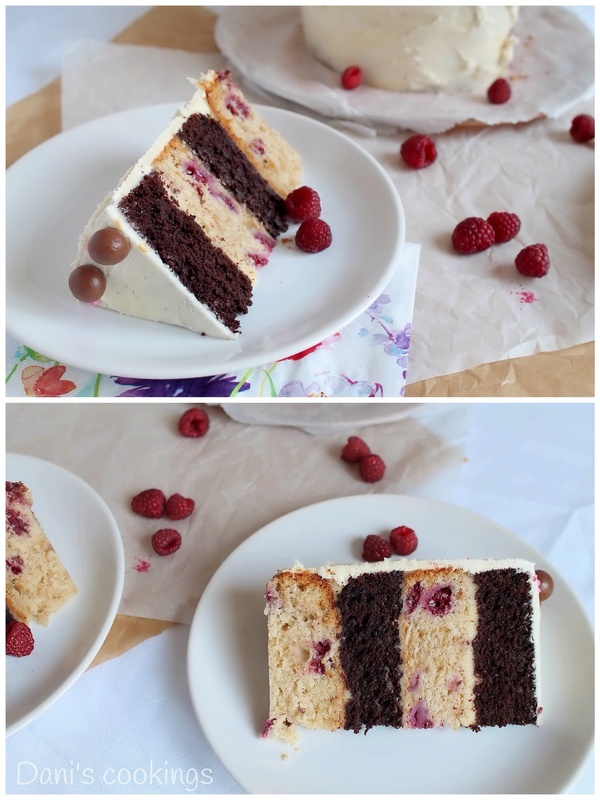 Wrap the cake tightly with cling film and leave it in the freezer for 15 minutes. 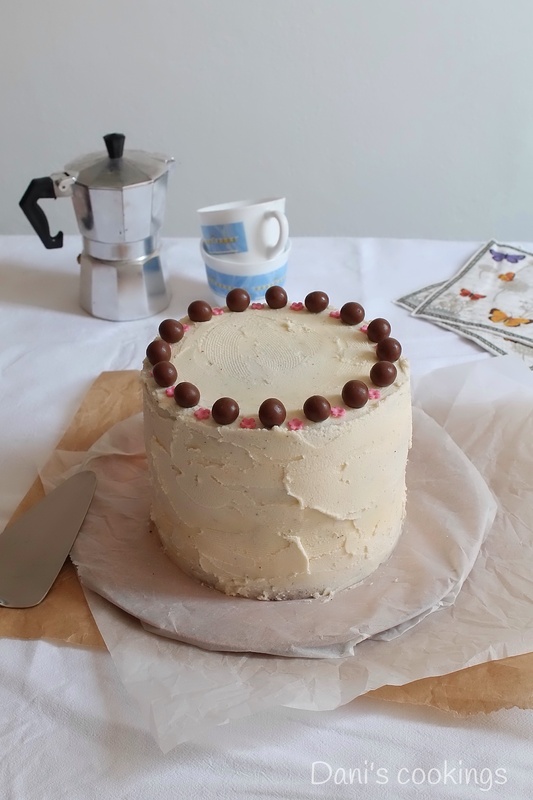 Unwrap the cake and cover it all around with the buttercream frosting (for best result first spread ½ of the frosting over the cake, then leave it in the freezer for 15 minutes to get firm before applying on top the rest of the frosting). Decorate the cake as you prefer. For the purpose of my pictures I used chocolate balls and fondant flowers but it would also look very well with fresh raspberries. в продуктите за шоколадовият блат сте пропуснали яйцата, после в описанието има да се добавят яйца, но нe става ясно колко? Много се извинявам за пропуска и благодаря, че ми обърнахте внимание! За нищо, радвам се че толкова бързо отговорихте 🙂 В Е-книгата също са пропуснати яйцата.